Denmark : When and where to go? The winter sees temperatures of around 0°C, and during the summer, the temperature reaches 25°C. The rains are fairly frequent in summer, and the sea water temperature never exceeds 19°C. May and September can be good times to visit Denmark, it is bright and cool, but avoid the months between October and April when the days are extremely short with wind and low clouds. 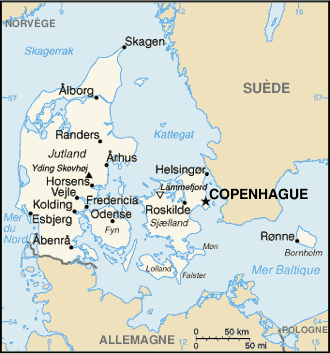 There are many international flights to Copenhagen. A visa is not required for EU citizens. The currency in circulation is the Danish Krona. The budget required is fairly highly as with all Scandinavian countries: A meal will cost about €25 and a double room will cost €60 in a Guest House, it's about 30% more expensive if you prefer a hotel. Note that camping outside a campsite is prohibited. There are no particular health issues in this country. For those who want to buy some souvenirs and can afford to do so, they can choose between wooden objects, textiles, porcelain, glassware and Lego ... of course!